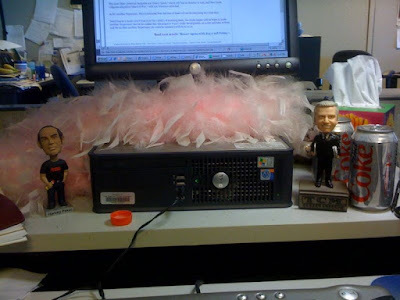 Robert Osborne is on my desk. Really. Well, OK, not the real Robert Osborne — the genial, learned host of Turner Classic Movies, who was just in town for SIFF in late May and who’s a regular at the fabulous Port Townsend Film Festival. But I am now the proud owner of a bobblehead Robert Osborne, which showed up in the mail this week as part of a promotion for the channel’s Summer Under the Stars series. For the month of August, each day will showcase a Hollywood star, including Cary Grant (Aug. 9), Clark Gable (Aug. 12), Audrey Hepburn (Aug. 11), Gene Hackman (Aug. 21), Frank Sinatra (Aug. 28) and many more. Good stuff. But you want to see that bobblehead, right? I’m especially pleased because now he’s flanking my computer with my Harvey Pekar bobblehead, which turned up when “American Splendor” was in theaters. (Terrific movie; check it out if you haven’t seen it already.) Both, as you can see, are only slightly taller than a Diet Coke, but Robert has a nicer pedestal and is, appropriately, carrying film canisters.